Q. What are the details of ‘Nationality’ criteria for UPSC-IAS Exams? Q. What are the lower and upper age limits for UPSC – CSE? GENERAL: 21 to 32 years. General 21 to 32 years. Age is calculated as on 1st August of the year of the examination. (For 2019 Exam, candidates born not earlier than 2 Aug, 1987 and not later than 1 Aug 1998 are eligible). SC/ST 5 years relaxation (21 to 37years). (a) A candidate must have attained the age of 21 years and must not have attained the age of 32 years on the 1st of August, 2019 i.e. candidate must have been born not earlier than 2nd August, 1987 and not later than 1st August, 1998. (v) up to a maximum of five years in the case of ECOs/SSCOs who have completed an initial period of assignment of five years of Military Service as on 1st August, 2019 and whose assignment has been extended beyond five years and in whose case the Ministry of Defence issues a certificate that they can apply for civil employment and that they will be released on three months’ notice on selection from the date of receipt of offer of appointment. (vi) up to a maximum of 10 yearsin case of (a) blindness or low vision; (b) deaf and hard of hearing; (c) locomotor disability including cerebral palsy, leprosy cured, dwarfism, acid attack victims and muscular dystrophy; (d) autism, intellectual disability, specific learning disability and mental illness; and (e) multiple disabilities from amongest persons under clauses (a) to (d) including deaf-blindness. Note 1:—Candidate should note that only the date of birth as recorded in the Matriculation/Secondary Examination certificate or an equivalent certificate on the date of submission of application will be accepted by the Commission, and no subsequent request for its change will be considered or granted. Q. What are the educational qualification required for UPSC – CSE? 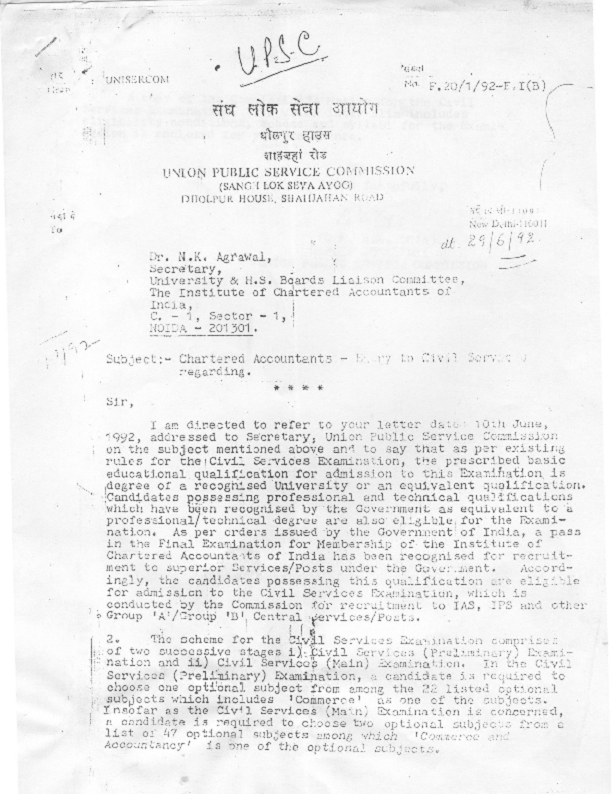 The candidate must hold a degree of any of Universities incorporated by an Act of the Central or State Legislature in India or other educational institutions established by an Act of Parliament or declared to be deemed as a University Under Section-3of the University Grants Commission Act, 1956, or possess an equivalent qualification. Candidates, who passed M.B.B.S. or any other Medical Examination but have not completed internship by the time of submission of their applications for the Civil Services (Main) Examination, will be provisionally admitted to the Examination under proviso as per notification. Note I: Candidates who have appeared at an examination the passing of which would render them educationally qualified for the Commission’s examination but have not been informed of the results as also the candidates who intend to appear at such a qualifying examination will also be eligible for admission to the Preliminary Examination. All candidates who are declared qualified by the Commission for taking the Civil Services (Main) Examination will be required to produce proof of passing the requisite examination with their application for the Main Examination failing which such candidates will not be admitted to the Main Examination. The applications for the Main Examination will be called sometime in the month of July/August, 2018. Note II: In exceptional cases the Union Public Service Commission may treat a candidate who does not have any of the foregoing qualifications as a qualified candidate provided that he/she has passed examination conducted by the other Institutions, the standard of which in the opinion of the Commission justifies his/her admission to the examination. Q. What are the minimum educational qualifications prescribed? The candidate must hold a degree of any of Universities incorporated by an Act of the Central or State Legislature in India or any other educational institution established by an Act of Parliament or declared to be deemed as a University under Section-3 of the University Grants Commission Act, 1956, or possess an equivalent qualification. Candidates must be physically fit according to physical standards for admission to Civil Services Examination as per guidelines given in Appendix-III of Rules for Examination published in the Gazette of India Extraordinary. Q: What is the eligibility for availing reservation by the Physically Disabled Persons? Q. What are the eligibility criteria in terms of physical requirements/ functional classification required for a Service/ Post? The physically disabled candidates shall also be required to meet special eligibility criteria in terms of physical requirements/functional classification (abilities/disabilities) consistent with requirements of the identified Service/Post as may be prescribed by its Cadre Controlling Authorities. The details of physical requirement and functional classification are given in the Rules of Examination. Q: How many attempts a candidate can have for UPSC – Civil Services Exams? SC/ST Up to 37 years (No limit). Q. If a candidate has applied for the Civil Services (Preliminary) Examination but has not appeared at any paper in the Civil Services (Preliminary) Examination will it be counted as an attempt? No, an attempt is counted only if a candidate has appeared in at least one paper in Civil Services (Preliminary) Examination. Q. What are the provisions regarding community reservation and change of community? A candidate will be eligible to get the benefit of community reservation only in case the particular community/ caste / tribe to which the candidates belong is included in the list of reserved communities issued by the Central Government. If a candidate indicates in his/her application form for Civil Services (Preliminary) Examination that he/she belongs to General category but subsequently writes to the Commission to change his/her category to a reserved one, such request shall not be entertained by the Commission. Similar principle will also be followed for physically disabled categories. Q. What are the provisions for reservation for SC, ST, OBC and Physically Disabled candidates? Q. For OBC candidates what are the requirements? Certificate supporting OBC status: Certificate issued by the District Officer/Sub-divisional Officer/any other officer as authorised by the government to issue such certificates of the district in which candidate’s parents reside. If parents are deceased, then the district in which the applicant normally lives will apply. Documents supporting non-creamy layer OBC status: Proof in support of service/landholding/status/income from different sources/property held by your parents in support of non-creamy layer OBC claim. Q. Whether a candidate belonging to a community included in the OBC list of states but not in the Central List of OBC’s? Commission arranges a meeting of the Head Examiner with the Additional Examiners after the Examination is over. At this stage, they discuss thoroughly the question paper, the appropriate answers and decide the standard of evaluation. To further bring about uniformity of assessment inter se the Examiners, the following procedure is undertaken: The Head Examiner conducts a sample survey of answer books of each Additional Examiner to verify whether the uniform standards of evaluation evolved in the meeting of Examiners have actually been followed. Depending on the standard adopted by the Additional Examiner, the Head Examiner may confirm the awards without any change if the Examiner has correctly followed the standard decided upon, or may carry out upward / downward moderation as considered necessary to ensure maximum possible degree of uniformity in the evaluation process. Therefore, the aspect of inter examiner variation in standards of evaluation in a Paper affecting candidates performance is taken care of adequately. Q. Who are included in OBC category? Q: In SC category what castes are included? In SC category what castes are included? Ans. Below is a link to official Indian government websites that provide the list of SC/ST. Q: What are the relaxation for Ex- serviceman? Q: Are Charted Accountants eligible for UPSC – CSE ? Yes , a Chartered Accountant is eligible for admission to civil services examination on the basis of his professional degree. As per the existing rules of CSE , the prescribed basic educational qualification is degree of any recognised university or an equivalent qualification . Candidates possessing professional and technical qualifications which have been recognised by the government as equivalent to professional/technical degree are also eligible for the examination. As per orders issued by GOI , a pass in the CA final examination has been recognised for recruitment to superior services/posts of the Government of India. Accordingly candidates possessing CA qualification are eligible for admission to civil services examination , which is for the recruitment of IAS/IPS etc. A copy of the letter sent by secretary , UPSC to ICAI regarding clarification on eligibility of Chartered Accountants for Civil services examination is attached for reference. Q. Is there any relaxation in number of attempts for physically handicapped? A physically handicapped will get as many attempts as are available to other non-physically handicapped candidates of his or her community, subject to the condition that a physically handicapped candidate belonging to the General Category shall be eligible for nine attempts. 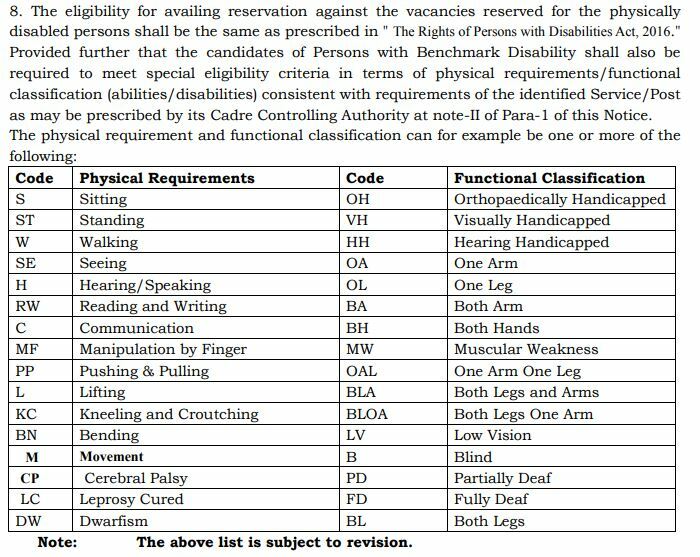 The relaxation will be available to the physically handicapped candidates who are eligible to avail of reservation applicable to such candidates. Q. Is a candidate who has done his graduation without passing class Xth and class XIIth eligible for civil service examination? Yes, provided the graduation has been completed from a recognized University and he/she possess the educational qualifications prescribed for the exam and is otherwise eligible. Q. Can a candidate who has completed his education from an Open school/ university apply for civil service examination? Yes, provided it is a recognized University and he/she possess the educational qualifications prescribed for the exam and is otherwise eligible.